Cliftonville manager Barry Gray is expecting a positive reaction from his players going into Friday night’s game against Institute. 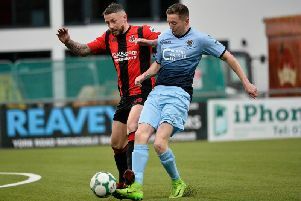 Gray, who was fuming after his side’s loss at Newry City last weekend and he’s expecting night against Paddy McLaughlin’s men. “I think what we are looking for is what we should be doing anyway,” he insisted. “Listen as a manager I’m not standing here pointing fingers at players, it’s not like that, it’s very much the case of everybody involved in my senior panel, whether it be staff, players or management, I want everyone to work hard. “Last week we were completely out worked by a Newry City, away from home and it just wasn’t acceptable on many levels for a Cliftonville team. “I’m not saying you are going to get it your own way all the time, but whenever it’s not your day, then at the very least you need to be working extremely hard to try and work your way out of it and if you don’t work your way out of it, then we’ll at least you can say that you tried your best to you can and we didn’t do that last week. “We need to see more of that this week and I think at Cliftonville we have been told about our consistency and I think that’s where it starts for me. It starts with a consistent approach on how hard you are going to work and fight for everything, every week against every opponent home and away. McLaughlin knows that Cliftonville are going to be like a wounded animal this evening and he believes Joe Gormley and Co will be highly motivated this evening. “Any team that has suffered a defeat and probably a surprise defeat and that’s no disrespect to Newry, that team is going to be a like a wounded animal and try to put things right as soon as possible,” he stated. “We know we are going to be in for a tough game and their forward line is probably as good as you get in the league. “Their strike force has proven over the last couple of years that they are as good as you get in the Irish League, they score goals for fun and we are going to have to be on top of our game, especially defensive, we need to be really disciplined and we’ll work on it during the week.